The son (Jackie Cooper) of a doctor (Willard Robertson) helps his new friend Sooky (Robert Coogan) earn enough money to release his pet dog from the pound. Based on the enormously popular comic strip by Percy Crosby, this amiable, surprisingly wistful tale of cross-class friendship feels at times like an extended episode of T.V.’s “The Little Rascals” — complete with self-possessed youngsters “putting on a show” to earn money — but ultimately provides more of an emotional punch. 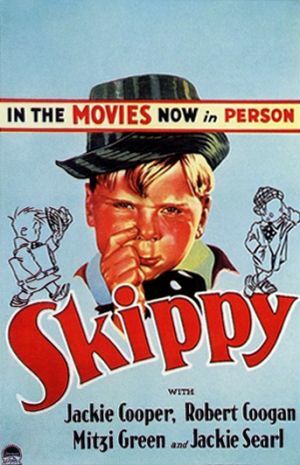 Jackie Cooper is excellent as the mischievous, devious, but kind-hearted Skippy, showing clear evidence of his child star talents. Robert Coogan is less of a natural actor (he’s clearly reading his lines and aware of the camera) but nonetheless manages to radiate just the right energy as drawling Sooky, the kid from the “wrong side of the tracks”. In Skippy and Sooky’s world, life most certainly isn’t “fair”, and kids must work hard to overcome the countless obstacles placed in their way by adults — such as when Sooky’s beloved dog Penny is cruelly hauled away by a mean-spirited dog-catcher, and the boys are told they have just three days to earn enough money to prevent her from being killed. The film’s denouement (given away by nearly every review — be forewarned) is surprisingly disturbing, adding unexpected pathos to the story as a whole. Note: Norman Taurog won an Oscar as Best Director of the year, Cooper was nominated as Best Actor of the year, and the screenplay (by Joseph Mankiewicz and Sam Mintz) was nominated as best Adaptation. Yes, as an Oscar-winning tale of childhood friendship. Agreed – a must as a cinematic tale of childhood friendship. This is another one that somehow never crossed my path in all these years – that I can recall, anyway. A film like this from 1931 would seem to be the kind of thing that an ff might think is covered in mothballs. And, in some ways, it is (most noticeably in the overall tone of Cooper’s parents, esp. in their early scenes: the stern patriarch; the propriety-conscious mom who instructs on politeness somewhat impolitely; both of them seeming a bit stiff in the company of their small son). But, as you watch, you’d have to be pretty cold-hearted for this story not to touch you. Cooper is indeed quite wonderful here, and wonderfully natural. Even though Coogan comes off as less of a pro, perhaps, and a bit stilted, he nevertheless balances Cooper nicely. My fave scene comes when Cooper tries everything he can think of to cheer Coogan up when the latter receives the worst news possible. It’s quite real watching Coogan barely listening to Cooper and sustaining quiet grief until just before he falls into his mother’s arms.